If a partial knee replacement is no longer possible (the damage to the joint surface is too great), the knee joint surface is replaced completely with "artificial knee joint". This means that the worn ends of the bones are replaced with metal and plastic parts. With a total knee replacement, the choice of method used to connect the upper and lower leg components, is most important. There are two prosthesis options for this, "fixed bearing" and "mobile bearing". 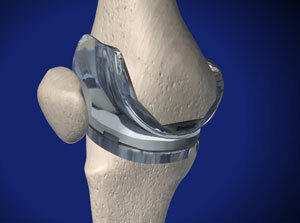 The mobile bearing prosthesis uses a moving "meniscus" disc, more closely resembling the natural structure of the knee. Total knee replacement surgery removes the damaged and painful areas of the femur (the thigh bone), and the tibia, (the lower leg bone). These areas are replaced with specially designed metal and plastic parts. First the damaged bone and cartilage are cut away from the femur. The end of the femur is reshaped to allow a metal femoral component to fit in place. Next the metal component is attached to the end of the femur with bone cement (acting as glue). The damaged bone and cartilage is then cut away from the tibia and the end is reshaped to receive the metal tibial component. The metal component is secured to the end of the tibia with bone cement, and a polyethylene insert is attached to the upper surface. This insert will support the body's weight and allow the femur to glide across the tibia. The new joint is formed by putting together the tibia (with it's new polyethylene surface) and the femur with it's new metal component. To make sure that the patella (knee cap) will glide smoothly over the new artificial knee, it's rear surface is prepared and a polyetheline plastic component is cemented into place. Finally, the new parts of the new joint are tested by flexing and extending the knee. A knee prosthesis is necessary when the articular cartilage becomes so severely damaged or worn away that levels of pain and discomfort in the knee are high and the knee joint ceases to function properly i.e. where there is a reduction in the joint range of motion in the joint, or in cases where the knee joint has become malpositioned. We advise a total knee replacement, only when both chambers of the knee are damaged to such an extent that partial prosthesis is not a viable option. However even if a total knee replacement is necessary, there are two treatment options available. One option involves “non cemented” fixation of the joint. Cementfree fixation provides a very stable and long lasting knee prosthesis even for the most active and athletic patients. 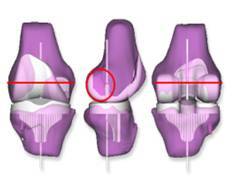 The knee joint is less likely to loosen over time, but requires a longer rehabilitation period (6 weeks). 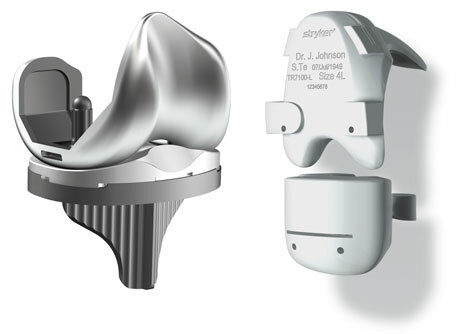 What types of implants for knee replacement are there? How is the surgery for total knee replacement carried out?